The fourth game of the 53rd Honinbo title match (sponsored by the Mainichi Newspaper) was held in Kita Kyushu City, Fukuoka Prefecture, on June 22 & 23. O Rissei had launched a counterattack after his bad start, picking up his first win of the series in the third game, but in the fourth Cho Honinbo, playing white, forced him to resignaiton after 166 moves. Cho now needs only one more win to win the Honinbo title for a record 10th successive term. Of their time allowances of eight hours each, Cho was down to his last minute and O had three hours 26 minutes left. The fifth game will be played in Tomakomai City, Hokkaido, on June 29 and 30. The third game of the 53rd Honinbo title match (sponsored by the Mainichi Newspaper) was held on June 11 & 12 in Aomori City. After losing the first two games, the challenger, O Rissei, bestirred himself and picked up his first win of the series. Playing white, O forced Cho Chikun to resignaiton after 162 moves. Of their time allowances of eight hours each, O had two hours 27 minutes left while Cho was down to his last minute. The fourth game will be played in Kita Kyushu City on June 22 and 23. The quarterfinals of the 11th Fujitsu Cup were held on Cheju Island, Korea, on June 5. Japan had two players still in the tournament, of whom O Rissei lost to Chang Hao of China and Hikosaka Naoto, the new Judan, defeated Korea's Cho Hoon-hyun. Hikosaka will meet Lee Chang-ho of Korea in the semifinals, to be played in Osaka on July 4. 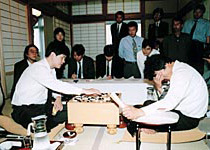 The second game of the 53rd Honinbo title match was played on Awaji Island, Hyogo Prefecture, on June 1 and 2. Playing white, Cho Chikun Honinbo forced O Rissei to resignaiton after 148 moves, so he now leads the match 2-0. Of their time allowances of eight hours each, O had 79 minutes left while Cho was down to his final minute. The third game will be played on June11 and 12 in Aomori City. The 20th World Amateur Go Championship, sponsored by Japan Airlines, was held at the Nihon Ki-in in Tokyo from December 2 to 5 with a record total of 50 countries and territories participating, including four making their WAGC debut. The winner of the eight-round Swiss-system tournament was Kim Chan Woo of Korea, who won all his games. This victory eliminated one of the 'seven wonders' of the go world: the failure by Korea to win the top amateur tournament in a period in which it has dominated international professional go. Second place was taken by Hiraoka Satoshi of Japan and third by Zhao Wen Dong of China.